Governor Aristoteles Sandoval and Mexico’s Energy Secretary Pedro Joaquin Coldwell inaugurated the first ever wind farm in the state of Jalisco on Monday. 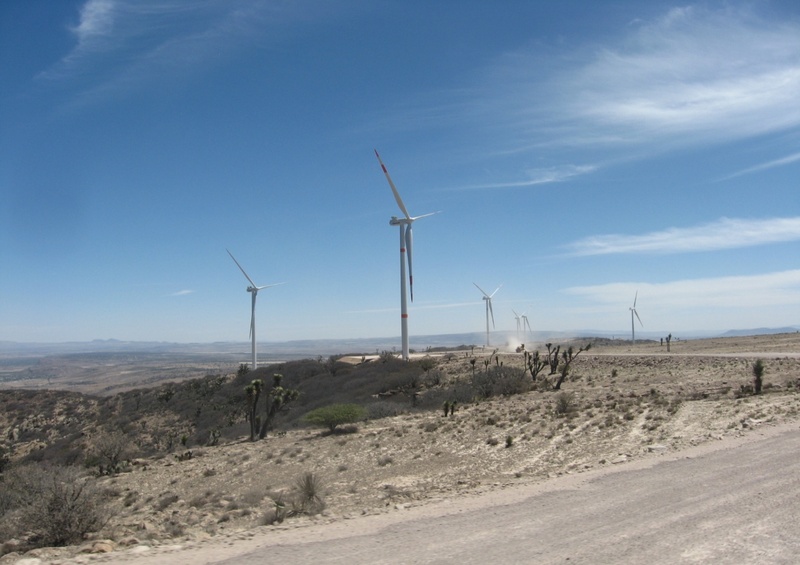 Located in the municipality of Ojuelos, the Los Altos Wind Farm was built by Grupo Dragon, a subsidiary of Mexican conglomerate Grupo Salinas, at a cost of almost 1.7 billion pesos. “This park is a global icon, it is the first to be built at 2,500 meters above sea level and the first of its size to be built in the Americas,” said Grupo Salinas President Ricardo Salinas Pliego. The wind farm has 28 turbines, each 125 meters high and with a capacity of 1.8 MW, creating a total capacity of 50.4 MW, or enough to meet the power needs of 72,000 households, according to EFE news agency. “This is an important step toward combating climate change,” Sandoval said. The facility will prevent around 80,000 tons of carbon dioxide from being released into the atmosphere every year. It will also result in savings of 126 million pesos over the next 25 years, according to the state government. “The fact that we are here today symbolizes that a new era in energy has begun in this country,” Coldwell said. Mexico must expand its electricity generation capacity by just above 80 percent over the next 15 years and will have to build power plants with a capacity of about 55,000 MW to meet demand, he explained. Not only will the wind farm have a positive ecological effect, it also benefited the local community as nearly 1,000 jobs were created during the construction phase, noted Enrique Ochoa, the head of Mexico’s Federal Electricity Commission (CFE). The wind farm will supply electricity to the Guadalajara metropolitan area; the municipalities of Puerto Vallarta, Lagos de Moreno, San Juan de los Lagos Ojuelos, Cocula, Jalostotitlan, Ixtlahuacan and Teocaltiche; and Grupo Salinas stores across Jalisco.